Business Etiquette - How Much Should I Spend on a Gift for My Boss? How Well Do You Know Your Boss? Can you name at least two or three things you boss enjoys doing in their spare time outside the office? If not, your relationship is more on the professional side, and it is not likely that your boss will notice or care much if you do not give him/her a gift. Can You Really Afford It? Is your desire to give a gift based on the fear you cannot afford not to give your boss a gift? If your job security is dependent upon giving your boss a gift, it is time to find a new boss. If it is about the money think "downloads." A $10 iTunes card or Amazon card will get you ten "tunes" or ten books on Kindel. There are not many too meaningful gifts that you can buy these days for $5.00, and a cheap gift will usually appear just that - cheap, insincere, or like a "token" gift. Cheap gifts send the message that you are only offering a gift because you felt that you had to, or were too lazy to put any thought into the gift. If you do not have the cash to spend, that's okay -- write a note card wishing your boss a happy birthday or happy holiday and jot a quick note about how much you appreciate them. Giving extravagant gifts to get something in return, or outshine co-workers is never a good idea. Extravagant gifts do not make you look good and usually make the recipient feel uncomfortable. Expensive gifts at work almost always seem out of proportion to any occasion, especially when compared to simple, less expensive gifts other workers are giving. The message you send is not how generous you are, but that you are a gift show off. Before selecting a gift, ask yourself what message does the gift -- and the reason for giving the gift -- convey about you? The right gift should show that you cared enough to give an appropriate and thoughtful gift out of appreciation and respect. A gift card of $10-$25 is appropriate; less is "cheap, " and more is not necessary. Whether you are purchasing a gift or making a gift, the value of the gift should not exceed $50.00. This does not mean you have to spend $50 on a gift but that the value of the gift should not exceed $50. For example, buying gifts on sale reduces your costs, but not the value of the gift. If you are giving a group gift, a suggested contribution of $5-$10 to the "pot" is more than enough to either buy an appropriate gift or gift card. Never insist that anyone contribute -- they may not be able to afford it or want to be involved. The key to successful group gifting is "suggested" guidelines, not force guidelines. Gift giving should feel good, not like punishment. If the group is purchasing a gift, the value of the gift should not exceed $50 times the number of people in the group the gift represents. This does not mean you have to spend $50 per person, but that the assessed value of the gift should not exceed that amount. Gift cards are like giving cash but are better than actual cash. When the recipient spends the gift card, they are more likely to remember the giver. Cash is a very personal gift and generally should not be given in the office place unless it is a taxable bonus from an employer. If your boss is well-liked and struggling financially and everyone is set on raising funds for the boss (or a co-worker), give a Visa (or other major credit) gift card. It can be spent like cash but will seem less like charity than handing them a personal check or cash. If you make more money and want to do so, the unwritten workplace gift giving "rules" allow you to give more. Just because you earn more or have a higher position in the company, you are still not required to give gifts. However, if you wish to give a gift to your boss give the gift as an individual unless you are part of sales, marketing, or other team-oriented departments. A gift card of $50-$100 is appropriate for upper wage earners; less is "cheap," and more is not necessary. If purchasing or making a gift, the value of the gift should not exceed $150.00. It does not mean you have to spend $150 on a gift but that the value of the gift should not exceed $150. If you are giving a group gift from a department where all team members are earning higher incomes, a contribution of $15-$25 is usually more than enough to either buy an appropriate gift or gift card. Never insist that anyone contribute - they may not be able to afford it if you think that they can. Making more money does not always mean you have more to spend. Unfortunately, there is often unwritten pressure when it comes to gift giving the higher you rise in a company. 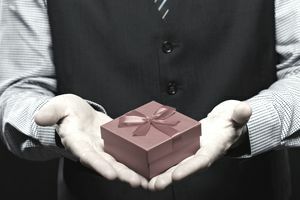 While there are no business or gift giving etiquette rules that require you to give gifts no matter what your income or position in the company, you may still feel obligated to do so.